Irrigation Trencher | Trench'N edge. The TRENCH 'N edge Irrigation Trencher is the most versatile trencher to hit the landscape industry in the last decade. The Irrigation Trencher was specifically designed to install all types of irrigation systems like PVC and poly pipe. It is also great for installing drain tile in athletic fields and golf courses. 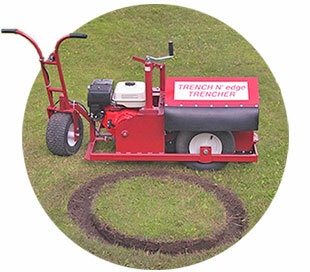 This trencher removes compacted soils and allows easy installation of fertilizer and mulch down to the feeder roots to help distressed trees grow. The trenching teeth may be set for cutting up to 2 1/2 inches or 1 3/4 wide. The depth of the trench is easily adjusted from 0 to 12 inches. This machine also eliminates the need to buy multiple blades for various widths and depths, which is required for fixed blade trenchers. The specially designed trencher teeth are made of replaceable carbide bits (available nationwide) that are mounted in steel holders or shark teeth. Trenching for drain tile, lawn sprinkler systems, low voltage landscape lighting cable, water lines and root pruning. This model cuts down to 0 to 7" and 2" or 5" wide.